Whether you’re building a new environmentally sustainable solar-powered home or making your existing abode more energy efficient, we recognize the importance of curb appeal. That’s why SunPower takes a fundamentally different approach to how we design and engineer complete solar energy solutions. Even with 70 percent fewer visible parts,1 our solar systems deliver 70 percent more energy compared to conventional solar technology in the same space over 25 years2. This means fewer panels and more flexibility for where they’re placed on your roof. Plus, we offer consumers our unique SunPower® Signature™ Black panels, which have a sleek appearance that better complements different home styles and a variety of roofing materials. And with our low-profile InvisiMount® mounting system, these gorgeous panels are about all that can be seen. Our customers even say that the panels seem to float on their rooftops. We work with top architects and home builders worldwide to design green homes and buildings that incorporate our solar because it meets their expectations for attractiveness, performance and durability. We’re looking forward to seeing many more of these professionals at Dwell on Design in Los Angeles this week. 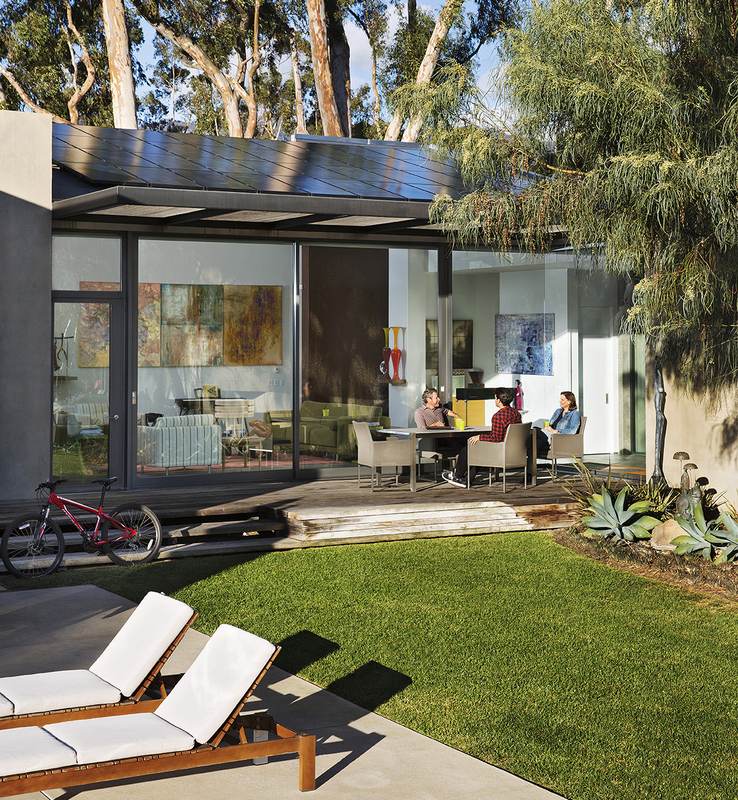 In the Dwell spirit of celebrating great modern home design, we’ll be occasionally posting stories here about SunPower solar homes that are as gorgeous as they are green. When Brad Albert, owner of Rising Sun Solar, built his dream home on Maui, he wanted to create a house for his family to enjoy that also had integrity in terms of sustainability, health aspects and air quality. His main goal was to achieve net zero energy consumption, which means the total amount of energy used by the home annually would be equal to the amount of renewable energy generated onsite. “I chose SunPower because I’m a solar dealer, and I know the benefits. It’s a reliable company that stands behind its products, and the panels just perform better. I really wouldn’t consider installing any other panel on my own house,” Albert says. His go-to panel is the 335-watt SunPower Signature Black for its sleek, minimalist aesthetics and compact footprint that would allow him to get more energy from a smaller space than conventional panels. The home has 36 panels, totaling 13 kilowatts, and there is enough roof space to add another 26 kilowatts if his energy needs ever change. Architect Jeffrey Lundahl incorporated a variety of passive and active techniques that would make the home more sustainable. In a tropical climate, controlling heat is important, so Lundahl considered that in planning the building’s orientation, location, size and shape. He designed a large roof to provide shade and to offer an optimal footprint and tilt angle for the solar panels. He ensured there would be adequate cross ventilation to reduce heat gain and cool the interior space. Albert says building his own solar home helped him better understand what solar consumers experience and ended up inspiring others in his community to incorporate green materials into their own sustainable modern tropical home designs — so much so that it landed the beautiful house a lengthy feature in Maui Nō Ka ʻOi magazine. With this beautiful sustainable home in Montecito, Calif., the primary goal was also to achieve net zero energy consumption. The entire house is designed to maximize energy efficiency, while keeping a very modern look and feel. Walls of glass, facing south, are covered by big curtains that the homeowners can open to warm the residence in the winter. Their water usage, important in the drought-stricken state, is minimal because they chose exceptionally efficient appliances such as low-flow toilets. Ceci Villaseñor Johnson of Sun Pacific Solar Electric worked with the architect and general contractor as the home was being designed and built, ensuring that the roof was properly angled for maximum sun exposure and that conduits could be run through the walls rather than on the outside of the home. She wanted to make sure that the solar system would be completely integrated into the home’s design and optimized for both aesthetics and energy production. The homeowners chose SunPower Signature Black panels because they would be flush to the roof and blend seamlessly with the home’s modern design. They were also attracted to the industry-leading 25-year Combined Power and Product Warranty, which gave them peace of mind about their investment. They started with 30 225-watt panels and later added 14 more to accommodate the electricity needed for a new pool, spa and fountain. Both the homeowners and Johnson were pleased with how easily they were able to expand the solar system in phases to meet the family’s energy demands over time. Because of SunPower’s greater efficiency and power output, as well as the uniform modular design of the system, there was plenty of usable roof space left to add more panels. “I love the fact that SunPower keeps the footprint of its panels the same. It makes design really easy, and we know that if there’s ever a problem with a panel (which is rare) we can replace it easily in the same space,” Johnson says. Did you design the green home of your dreams with SunPower solar? Tell us about it! Post your solar story on our customer community page with "Solar is Beautiful," in the title and we might feature it in a future blog post. SunPower will be exhibiting at Dwell's design conference, June 24-26, at the Los Angeles Convention Center. Visit our interactive mobile Solar Design Studio there to learn more. Interested in going solar? Visit our solar calculator to find out how much you can save. 1 Analysis of SunPower Equinox™ system versus residential solar systems containing conventional panels, string inverters and racking hardware. 2 SunPower 345W, 21.5% efficient compared to a Conventional Panel (250W, 15.3% efficient, approx. 1.6 m2), 9% more energy per watt, 0.75%/yr slower degradation. BEW/DNV Engineering "SunPower Yield Report," 2013 with CFV Solar Test Lab Report #12063, temp. coef. calculation. Campeau, Z. et al. "SunPower Module Degradation Rate," SunPower white paper, 2013. See www.sunpowercorp.com/facts for details. 2 Analysis of SunPower Equinox™ system versus residential solar systems containing conventional panels, string inverters and racking hardware.